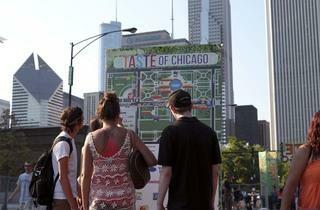 The Taste of Chicago takes place annually in Grant Park; here's how to get there. 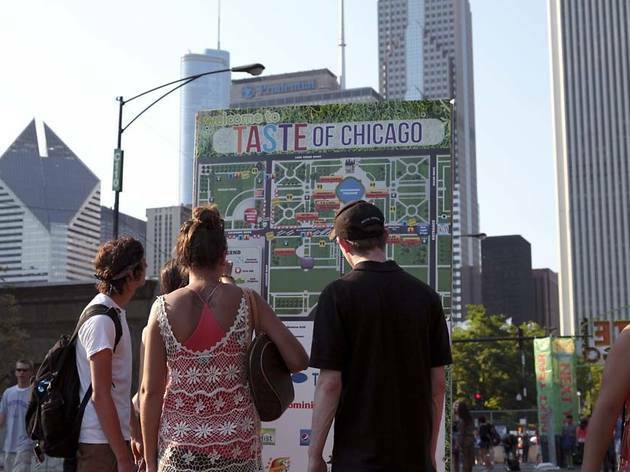 The Taste of Chicago takes place in Grant Park, and its focal point is the intersection of Jackson and Columbus Drives, just southeast of the Art Institute of Chicago (111 S Michigan Ave). The 2014 festival runs July 9–13 from 11am–9pm Wednesday through Friday, 10am-9pm Saturday and Sunday. There is no entry fee. Food and drink tickets are sold in packs of 12 for $8.50, and ticket sales end each day at 8:30pm. A "Taste" (i.e., smaller portion) from a food vendor usually costs about four tickets. No pets or alcohol allowed. On the El: The closest El stops are Adams/Wabash (Brown, Purple, Green, Orange, Pink), Jackson (Red) and Jackson (Blue). Walking directions from the Adams/Wabash Stop: Walk east (toward the Art Institute and Michigan Avenue) on Adams St, take a right on Michigan Ave, then turn left on Jackson Blvd; you'll see (or smell) the Taste of Chicago from there. Walking directions form the Jackson stop (Red or Blue): Walk east along Jackson toward Michigan Ave/the lake until you hit Columbus Drive. On the bus: The 1, 3, 4, 6, 7, 26, 28, 143, 147 all make stops near the entrance to the Taste of Chicago, near the intersection of Jackson Blvd and Michigan Ave.
For more info: See transitchicago.com for detailed transportation maps and schedules. Bike racks are located around the perimeter of Grant Park. However, there is no bike valet, so take heavy precautions against bike theft when locking your bike. When biking, watch out for tourist drivers who are not accustomed to cyclists. See chicagobikes.org for bike routes and tips. You can also ride a Divvy bike to the station at Jackson Dr and Michigan Ave.
Traffic near the Taste of Chicago can be severe, and parking can be very expensive. We do not recommend driving to the Taste of Chicago. From 90/94: Exit Congress Pkwy, and merge onto I-290 East/Congress Pkwy. Continue on Congress Pkwy and turn left on Michigan Ave to park in the South Grant Park Millennium Garages parking garage. Coming from the South Side via Lake Shore Drive: Turn left on Balbo Drive, then turn right on Michigan Ave to park in the South Grant Park Millennium Garages parking garage. Less eye-gouging parking can be found in the South Loop. We recommend the lot on Wabash Ave between Congress Blvd and Harrison St. Street parking is extremely difficult in this area. Where is the closest non-portable bathroom to the Taste of Chicago? Try the Pritzker Pavilion at Millennium Park (Columbus Drive and Randolph St) or the Chicago Cultural Center (Washington St and Michigan Ave).